One2One Physical TherapyServicesSound and Vibrational TherapyWhat are Biofield Therapies? This article aims to explain, provide evidence for, and demonstrate the clinical effectiveness of biofield therapies. Biofield therapies have the potential to impact multiple dimensions of the human body and serve as an underlying quantum level matrix that integrates them together. Our bodies are composed of trillions of particles, referred to as subatomic particles. Examples are electrons, protons, and neutrons. Each of these particles has a pattern of spin. 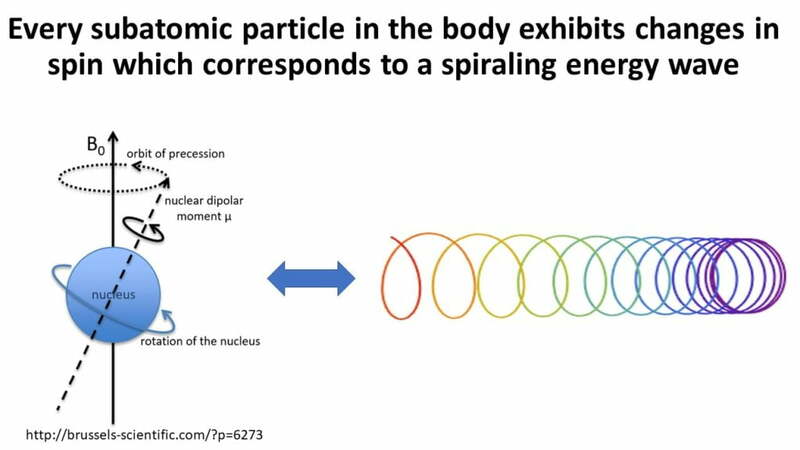 When the direction or speed of particle spin changes there is a corresponding energy wave that is generated. 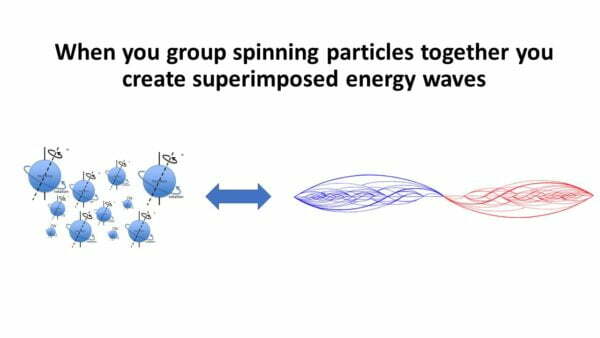 Now imagine multiple particles (we have trillions in our body) spinning in concert together. It is the sum pattern of all of these waves emanating from the particles in our body that comprises our biofield. 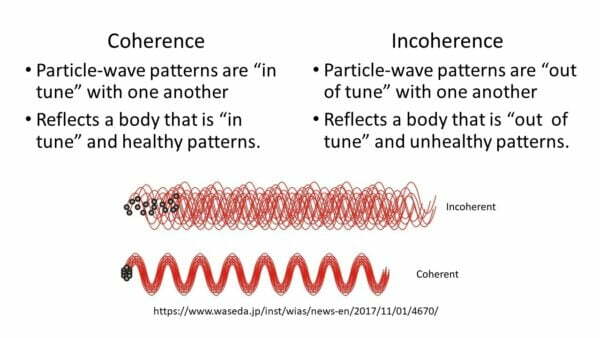 Furthermore, the patterns within these torsional waves represent information of the body. For more details on the quantum physics of a biofield, Dr. Claude Swanson’s text, “Life Force: The Scientific Basis” is recommended. There are currently numerous scientific publications that explain biofield science (Jain et al., 2015; Kafatos et al., 2015; Kreitzer & Saper, 2015; Movaffaghi & Farsi, 2009; Rein, 2004; Rubik, 2002; Rubik, Muehsam, Hammerschlag, & Jain, 2015). In 1992, during the United States National Institutes of Health (NIH) Conference, the term “biofield” was defined as: “a massless field, not necessarily electromagnetic, that surrounds and permeates living bodies and affects the body.” In 1994, biofield therapies were officially recognized as an alternative treatment by NIH and were defined as “noninvasive, practitioner-mediated therapies that explicitly work with the biofield of both the practitioner and client to stimulate a healing response in the client.” The National Center for Complementary and Alternative Medicine was formed in 1998 (now referred to as The National Center for Complementary and Integrative Health (NCCIH)) and is the federal government’s lead agency for scientific research on the diverse medical and health care systems, practices, and products that are not generally considered part of conventional medicine. In 2017, NCCIH had an annual budget of $130.5 million. 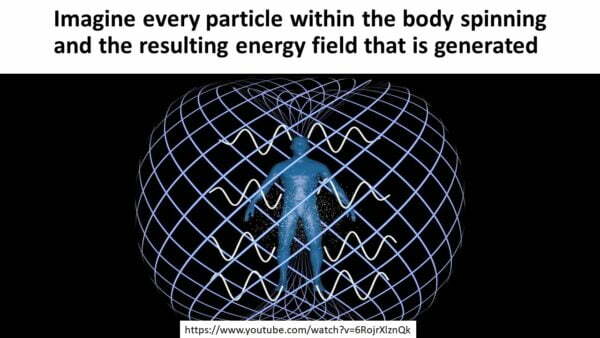 Ideally, the patterns of energy waves in the biofield would be “in tune” with one another. This is referred to as coherence and is analogous to listening to a symphony. Let’s pretend that each string on an instrument represents an atom, each instrument to be a cell, each section of instruments to be an organ, and the entire symphony to represent the whole system of the body. In a well-played and conducted symphony/human system all of these parts would be in harmony and coherently synchronized with one another. On the other hand, if there are areas which are not in tune and dissonant, incoherence will manifest. In sum, a biofield is an energy blueprint that corresponds holistically to an entire organism. It allows for rapid communication throughout the body. It is the matrix that connects our physical, emotional, and mental dimensions. The goal of biofield therapies is to create improved coherence within the biofield so that the corresponding physical, mental, and emotional aspects of the body also become more coherent and healthy. There are currently many different types of biofield therapies. Some examples include Healing Touch (HT), Pranic healing, Reiki, Qigong, Therapeutic touch (TT), Biofield Tuning, and the Regenetics Method. Therapeutic touch is recognized in the Nursing Intervention Classification Code and in some state licensure boards as within the scope of nursing practice. Biofield therapies are generally classified as either direct or indirect. In the direct method, the practitioner utilizes physical contact with the recipient over the targeted treatment area. Whereas in the indirect method the practitioner delivers the therapy without direct contact with the recipient. This is possible because biofield therapies work within the biofield where direct contact is not required. Regarding utilization of biofield therapies, in the 2012 National Health Interview Survey, >3.7 million US adult citizens surveyed “have ever” seen a practitioner for energy healing therapy and >1.6 million adults in the US reported seeing an energy healing therapy practitioner at least once in the past 12 months. There is a substantial body of evidence supporting the effectiveness of biofield therapies. In the publication “Clinical Studies of Biofield Therapies: Summary, Methodological Challenges, and Recommendations” by Jain et al (2015) over 30 published clinical trials were identified demonstrating positive effects of biofield therapies for pain in ambulatory and hospitalized patient populations with chronic pain, arthritis, and movement restriction. Jain and Mills (2010) performed a systematic review of 66 clinical studies utilizing a variety of biofield therapies in different patient populations. The results showed that biofield therapies had strong evidence for decreasing pain intensity in pain populations and moderate evidence for improving pain intensity in hospitalized and cancer populations, decreasing negative behavioral symptoms in dementia, and reducing anxiety for hospitalized populations. Additional studies have demonstrated positive results on improving heart rate variability (HRV) and anxiety (MacIntyre et al 2008); decreasing depression, persistent fatigue, and positive effects on diurnal cortisol variability in fatigued breast cancer patients compared to mock treatments or standard care. (Running et al, 2015), (Fitzhenry et al, 2014); reducing depressive symptoms and blunted drop in natural killer cell cytotoxicity in cervical cancer patients (Lutgendorf et al, 2010); and improving symptoms of depression, chronic widespread pain, and tenderness in patients with fibromyalgia (Sarmento et al, 2017). A group of Physical Therapists conducted a randomized, placebo-controlled, double-blind study on the effects of Oscillatory Biofield Therapy (OBFT) on individuals with carpal tunnel syndrome (Nourbakhsh et al, 2016). OBFT involves a hands-on technique where the practitioner intentionally directs therapeutic energy to the targeted area. 30 subjects were randomly assigned to either a treatment or sham control group. Both groups received the same exact physical procedures in that they underwent 6 sessions over a two week period of the practitioner providing direct hand contact to the carpal tunnel at the wrist. In the treatment group the practitioner had intention and therapeutic manipulation of the patient’s biofield whereas in the mock group there was no conscious intention to interact with the recipient’s biofield. The results showed clinically and statistically significant changes in intensity of pain with activity, night pain (DASH questionnaire), and Functional Status Scale (FSS) between the treatment and placebo groups. There was a statistically significant reduction in the number of patients with positive results on the Phalen’s test, Tinel’s sign, and hand paresthesia in the treatment group. At a 6-month follow-up, 86% of patients in the treatment group remained pain free and had no functional limitations. The physical, mental, and emotional aspects of the human body are ultimately interconnected with one another and represented within matrix of the biofield. Therefore, creating improved biofield coherence can in turn facilitate improved physical, mental, & emotional function. 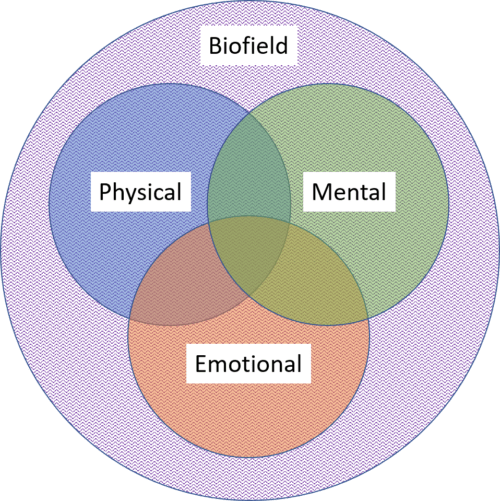 Likewise, facilitating better physical, mental, and emotional function can result in improved biofield coherence. There is a bidirectional relationship between these domains of bio-matter and bio-energy. What is significant to note about Pain Science is that it is primarily a conscious based learning approach. Meaning, it provides awareness and a rational explanation for individuals to understand why they may hurt and be limited in function. This insight is an important first step and component in the healing process and research, as just referenced, supports its effectiveness. However, such a conscious based approach does not always provide enough of a stimulus for true changes to manifest within a multi-dimensional body. This is because much of the essence that creates one’s self-limiting beliefs and emotional patterns is sourced at the unconscious level. Science has shown that our brains make decisions and take action before we are consciously aware of them. Sam Harris’s book, “Free Will” describes compelling evidence of this phenomena supporting the idea that it is primarily our unconscious self that is directing our behavior. Taking this a step further, these unconscious patterns are ultimately encoded within our biofield which contains the informational hardware of our bodies. Because of the power of biofield based therapies to go into the unconscious realms of the mind and body, shifts and the ability to learn patterns that were previously unobtainable can then become achievable. Furthermore, when you couple biofield therapies with conscious based physical, mental, and emotional therapies an even more powerful stimulus for permanent change is born. It is through this multidimensional integration that true healing can manifest in our conscious physical reality. The following are two case studies demonstrating the effectiveness of integrating biofield therapies with Physical Therapy intervention. History: In August 2015 this 64 year old woman was referred to One 2 One Physical Therapy for insidious onset of right leg radiculopathy of about 5 weeks duration. However, in April 2015 she had fallen and dislocated her right jaw. Since then she had been experiencing balance problems and visual disturbances such as trouble parking her car in a straight line. Her posture and gait demonstrated a significant amount of trunk and head sidebending to the left. She leaned and veered off to the left when walking. At this time, she received 5 Physical Therapy sessions utilizing the method of Postural Restoration over 6 weeks. At her final session she was less oriented to the left at head and trunk but still was not completely neutral. She reported her parking was straighter and was experiencing significantly less pain. 2 years later on 7/21/2017 she presented to Physical Therapy again with a similar pattern that she had 2 years ago but this time it was more pronounced. She complained of difficulty walking and balance in which she had fallen off her bike twice over the past few months. She was experiencing visual disturbances (lines on the road moving), problems with depth perception making stair negotiation difficult, and light sensitivity. In addition to these issues she reported low back pain. She had decreased balance standing on one leg where she could balance on the left ~ 3 sec and on the right ~10 sec. When she lay down on her back her head was oriented ~20 degrees to the left as depicted in the picture below. You can see in in the video below her gait pattern is significantly oriented to the left as well as veering to the left. She also requires sunglasses due to light sensitivity. For this episode of care it was determined to integrate biofield therapies. The pattern that this individual was posturing in indicated that she was still in a trauma pattern related to falling onto the right side of her face ~ 2.5 years ago. Her physical behavior demonstrated an aversion to the right side of her body. In order to assist her with processing this the biofield therapy, Biofield Tuning, was chosen. Biofield Tuning was created by Eileen Day McKusick over 20 years ago. Eileen discovered that the human body could hold traumatic or stressful memories in their biofield. These patterns could be detected as incoherent sound patterns via activated tuning forks within the field. Furthermore, these areas of dissonance within the biofield could be entrained into a coherent pattern via the tuning forks. This 5 minute video by Eileen describes the basic principles of Biofield Tuning. Prior to receiving Biofield Tuning, 5 minutes of cold laser (Terra Quant Pro at 660, 875, 905 nm) at 5Hz to the right face and forehead was applied. Laser emits coherent light at specific wavelengths and frequencies which can serve as a stimulus to not only facilitate cellular healing (as what it is traditionally intended for) but to also create coherence within the associated biofield. 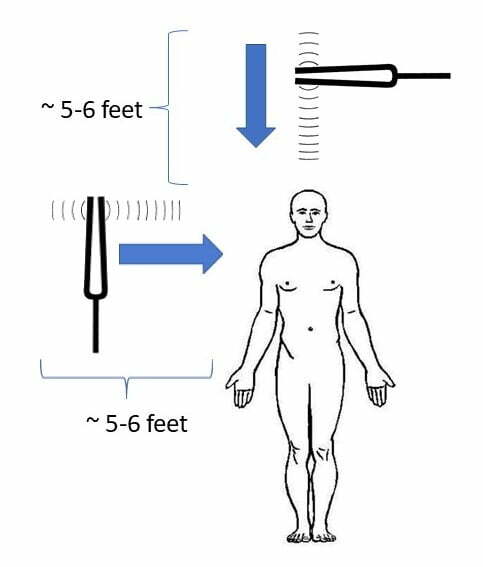 After the cold laser, 20 minutes of Biofield Tuning was performed working vertically towards the feet and then towards the head. This diagram depicts this intervention pattern. Immediately after treatment her orientation to the vertical significantly changed from 20 to 10 degrees. Her gait also significantly improved demonstrating improved orientation to the vertical. You can see in the before and after gait videos a significant improvement in trunk rotation and arm swing. She has also removed her sunglasses. The picture and video below demonstrate her presentation prior to treatment #3 and the carryover from the prior session. Her head position is straight and she has maintained improved trunk rotation and arm swing. At this point, it was determined that the trauma associated with her fall had been appropriately processed as indicated by her straight vertical orientation. Her primary complaint and objective limitation was balance, particularly on the left leg. The focus of treatment was thus redirected and Postural Restoration training was initiated to improve her ability to ground and balance. She received 15 minutes of Postural Restoration teaching her how to properly activate and integrate her left hamstring, abdominals, diaphragm, and right gluteus maximus which resulted in an immediate and positive improvement in her left single leg balance ability. 2 weeks later she presented for her 4th session reporting good improvement with her balance but her parking still seemed to be a little off. Treatment this session consisted of continued progressive Postural Restoration training. Her 5th visit was 2 months later (5 months after her initial first visit). Below are videos of her gait and left single leg balance at the start of this final session. This first case study had a control because this individual was seen for the same issues in 2015 and again in 2017. Her 2015 course of treatment did not include biofield therapies and only consisted of Postural Restoration. Even though she made adequate progress during this time she still postured to the left in space at the time of her final 2015 session. When she presented again in 2017 her symptoms were more profound than in 2015 but her 2017 treatment course integrating biofield therapies and Postural Restoration resulted in a far superior outcome. 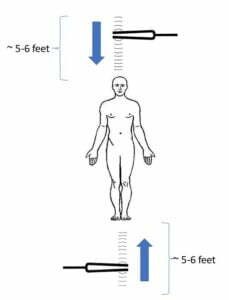 One may argue that it was merely the sound evoked by the tuning forks at specific areas around her body that redirected this individual to a more neutral orientation. What makes Biofield Tuning special is that it has therapeutic elements that translate over into both our biofield and physical sensory realms. The sound and tactile sensory stimuli generated via the unweighted (sound only) and weighted forks (applied directly to the body) provide a coherent biofield and neurosensory stimulus in which both can be therapeutic in nature. Furthermore, when combined these dimensions are likely to create even more potential for beneficial change. As described by Eileen in her video, merited by the thousands of other Biofield Tuning practitioners, and the thousands of recipients of Biofield Tuning when the forks are actively engaged within an individual’s biofield the sound and sensation of the fork changes depending on the level of coherence or incoherence in the biofield. This demonstrates the variety of tone and information that can be picked up within one’s biofield as a real phenomenon and that it is not only an auditory sensory experience. This next case study involves a 60 year old woman with a 30 year history of multiple sclerosis. She required a rollator for community and mobility and a quad cane/rollator for household mobility. When she went down stairs she needed a cane plus assistance because she felt like she was constantly falling backwards and had to lean forward to not fall. She felt like she did not know where the right side of her body was. At the time of her evaluation, she was unable to attempt lifting either leg for single leg balance. When attempting left single leg balance she required upper body support. 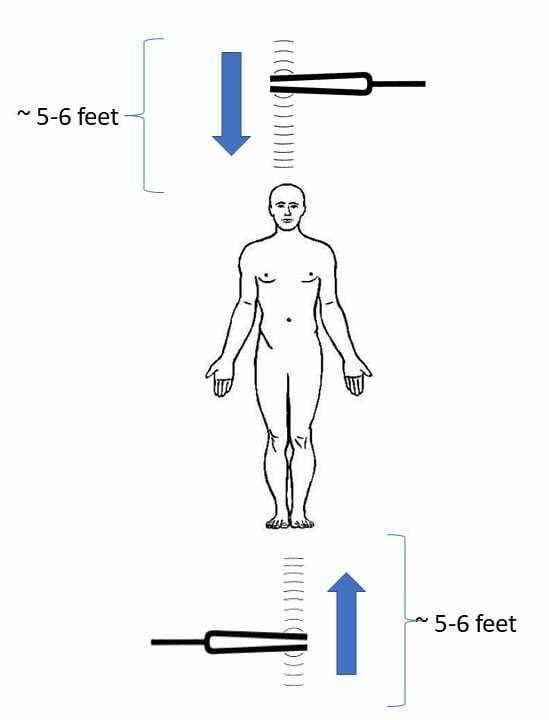 During ambulation she demonstrated decreased left compared to right stance stability with a slow cadence and no appreciable trunk, pelvic, or arm movement which is depicted in the video below. Below are videos of her initial ability to balance on one leg and walk. You may notice that when attempting to balance on the left leg she in unable to let go of the table for support. She does not feel comfortable trying to lift either leg. During this first session, she was instructed in Buteyko reduced breathing to improve carbon dioxide tolerance and subsequent cellular oxygen delivery. For more information on the Buteyko breathing method please refer here. After a few minutes of reduced breathing training her contol pause improved from 5 to 10 seconds. She was also instructed in proper tongue posture as she did not habitually fully rest her tongue on her palate. Proper tongue posture has important implications for breathing and neuromuscular tension in the body. For more information on this topic please refer to the following article. By the end of her session her cervical range of motion had improved from a 100% to ~ 75% restriction. She was instructed to continue with reduced breathing and tongue posture mindfulness as her home program. Finally, she was educated about biofield therapies and their connection to our physical, mental, and emotional health in which she was open to trying at her next session. Her second session was 5 days later. Objectively, she presented as she did the prior session with a carryover in the improvement of her cervical range of motion that was gained during the first session (100% to 75% restriction). Her gait and single leg balance remained unchanged from the initial evaluation. During this second visit she received a biofield therapeutic technique using intention and vowel sounds at specific frequencies (Regenetics Method developed by Sol Luckman). For more information about this technique please refer here. Below are comparison videos of her walking before the biofield therapy and 1 month later. She demonstrates significant improvement in left stance stability, gait speed, pelvic/trunk rotation, and arm swing. The blur to her face hides her expression and remarks that communicate how thrilled she is with her progress. Objectively, her straight leg raise improved to 80 degrees bilaterally (initial 90 L, 60 R), her hip abduction range of motion on the right improved from 0-5 to 25 degrees and her hip adduction range of motion on the right improved from 0 degrees to about 15 degrees. Treatment during her 3rd session consisted of 20 minutes of Biofield Tuning (as described in the prior case) focusing on the biofield associated with her left pelvis; reviewing Buteyko reduced breathing, and adding a standing dynamic balance exercise. This exercise consisted of standing circles and figure 8s in clockwise and counterclockwise directions to facilitate her ankle and hip balance strategies. Her 4th session was ~ 2 weeks later where she reported “I am not using the walker anymore. I don’t think I need the quad cane anymore. I don’t need my glasses to watch TV anymore. I don’t feel like I am falling back anymore on stairs. I am doing stairs better but I get tired very easily. I get tired getting from the car to the house (18 steps total). 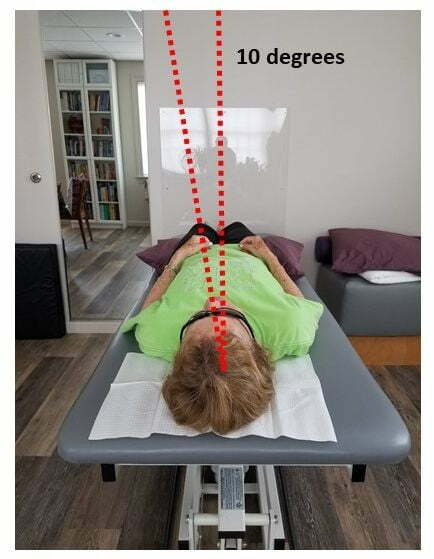 I am not depressed or feel anxious.” Her objective postural testing was similar to the prior session but her C0-1/subcranial sidebending was now only minimally restricted (max at initial status) and her cervical sidebending was moderately restricted (max at initial status). Treatment during her 4th session consisted of 20 minutes of Biofield Tuning including her entire left biofield, circular/figure 8 clockwise and counterclockwise weight shifts as previous, and instruction in a Postural Restoration breathing technique using a balloon in a short seated position. She presented to her 5th session 2 weeks later with a subjective report of “I am walking faster. Sometimes I don’t carry a cane. The other day I was tired going up the last bit of stairs but overall they aren’t an issue. Endurance is better. 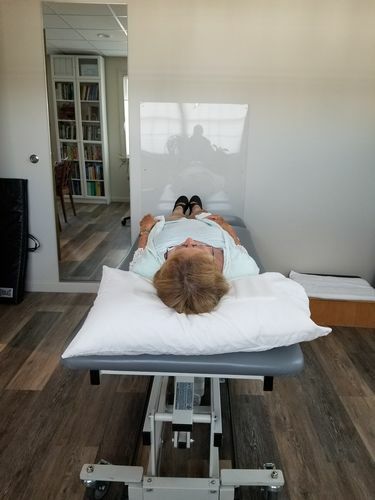 I don’t feel like I am falling backwards anymore.” This 5th session consisted of a co-treat with a behavioral Optometrist (Robert Jacobs, OD) to ensure her current glasses prescription was still appropriate for her. 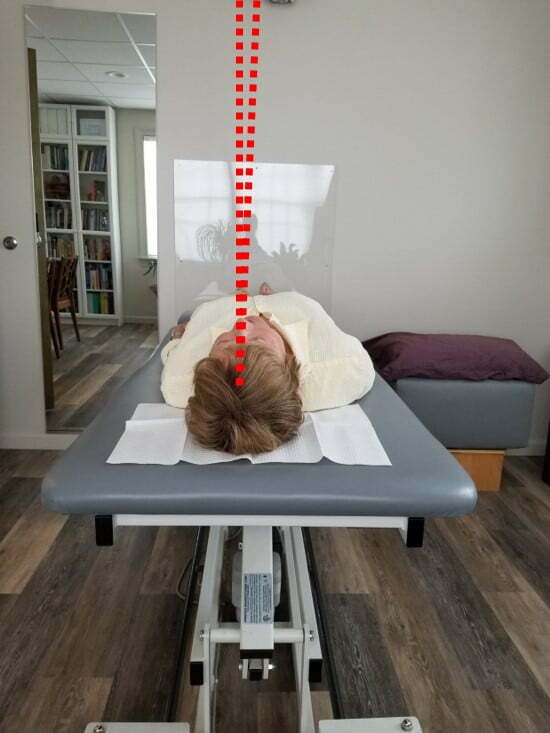 It is common with these types of cases that as an individual makes significant postural progress their visual system also improves due to the intregrated nature of our postural and visual systems. Her initial visual prescription was OD: +50 OS: -125-75 x 155 indicating significant asymmetry between her left and right eyes. Dr. Jacobs then determined that her prescription had changed to OD: +75-25×20 OS: -87-75×160 indicating less asymmetry and nearsightedness in the left eye. Below is a demonstration of how her single leg balance improved when she was in the more appropriate visual prescription. Her gait was also filmed during the start of session #5 in her original visual prescription. As compared to the video 2 months prior there is even further improvement with her left stance stability, gait speed, pelvic/trunk rotation, and arm swing. Two days after the Optometric co-treat session she came for a regular Physical Therapy session. Her initial single leg balance was equivalent to what it was 2 days prior (shown in the video below). 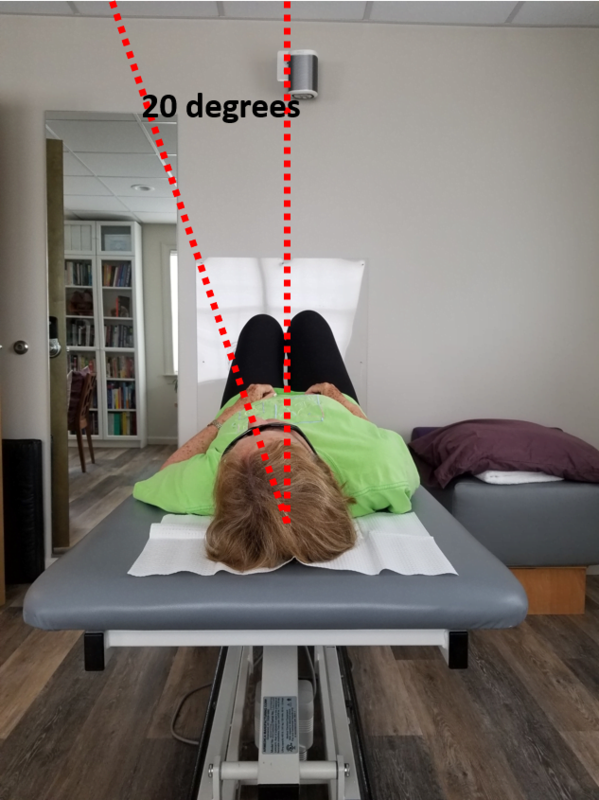 She then received 10 minutes of Postural Restoration training focusing on improving activation and integration of her hamstrings, abdominals, and diaphragm using the following technique developed by Ron Hruska of the Postural Restoration Institute. Immediately after performing this technique her single leg balance dramatically improved as shown below. In summary, this individual demonstrated a powerful response to biofield therapy intervention where there was a direct physical, mental, and emotional carry-over. 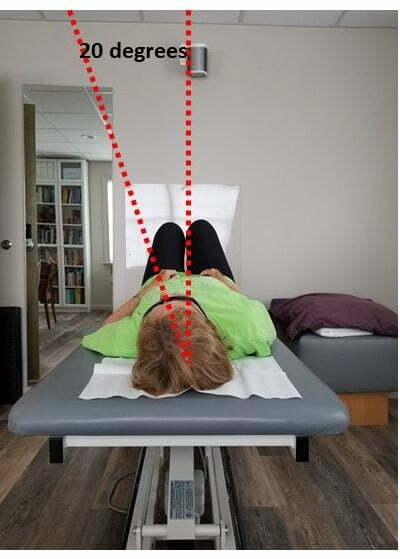 However, she still required concurrent Physical Therapy intervention using the method of Postural Restoration to facilitate further physical progress and carry-over. In conclusion, biofield therapies can be an effective tool to integrate within an individual’s treatment plan. Biofield therapies have the potential to impact physical, emotional, and mental patterns which comprise the multi-dimensional aspects of a human being. The profession of Physical Therapy is increasingly recognizing and incorporating “Pain Science” education within individuals’ plans of care as evidence has shown that our beliefs and emotions have a significant impact on our physical state of being. Biofield therapies offer the potential to impact these patterns at the unconscious level and in their elemental form within the biofield. There currently is strong evidence supporting the use of biofield therapies for pain and moderate evidence for improving negative behavior and emotional patterns. Clinical experience (~ 1500 sessions to date (4/2018)) supports biofield therapy integration in cases where other physiological conditions (examples-autoimmune disease and fibromyalgia), trauma, negative emotional patterns, and/or self-limiting beliefs may be limiting progress. Day McKusisk, E. (2014). Tuning the Human Biofield. Simon and Schuster. Harris, S. (2012). Free Will. Free Press. Luckman, S. (2010). Conscious Healing: Book One on the Regenetics Method. Raleigh, NC: Crow Rising Transformational Media through Lulu Enterprises, Inc.
Luckman, S. (2011). Potentiate your DNA. Raleigh, NC: Crow Rising Transformational Media through Lulu Enterprises, Inc.
MacIntyre, B., Hamilton, J., Fricke, T., Ma, W., Mehle, S., & Michel, M. (2008). The efficacy of healing touch in coronary artery bypass surgery recovery: a randomized clinical trial. Alternative Therapies in Health and Medicine, 14(4), 24–32. Sarmento, F., Tanaka, H., Cordeiro, E., & Suzuki, K. (2017). Effectiveness of Biofield Therapy for Patients Diagnosed With Fibromyalgia. Alternative Therapies in Health and Medicine. Swanson, C. (2011). Life Force, The Scientific Basis. Poseidia Press.